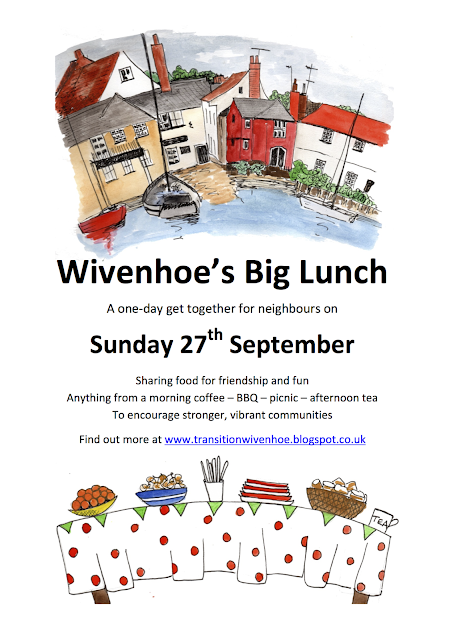 We have a new annual food event - Wivenhoe's Big Lunch. It involves getting together with your neighbours at some time during Sunday 27th September for the simple act of sharing food for community, friendship, and fun. It can be as simple or ornate an affair as you fancy - anything goes! We'll be posting further ideas for themes and ideas in the run-up, and would love to hear about what you're planning. For now we hope you'll feel inspired to mark the date in your diaries! We are holding a sale of nearly new ladies clothes on Sunday September 20th, at The Scout and Guide Hall in Wivenhoe, 11am-3pm. There will be tea and cake, for that break between buying! All proceeds to go to Syrian Refugees. Help will be needed at the sale on the day, and before, to help sort the clothes. We are aware that it clashes with a big Bennison Day, and some of you will have commitment there, but if so, it would be great if you could help with the sorting, or even make a cake! All depends on the clothes though, so now could be the time to sort out your wardrobes, and donate items of good, saleable items of ladies clothing. Then come along and find yourself something lovely and new to wear! We are happy to collect if needed.